Home /Blogs /John Tierney's blog /Looks good but it's all wrong - how not to look after an Irish historic graveyard. In fairness to whoever in that Mayo graveyard thought covering the site in gravel was a good idea here are a few points as to why it's not. 1. Historic graveyards are not modern cemeteries - they have their own character. Which in approx 600 graveyards I have been in has never once involved being covered in gravel. This is a 21st century innovation which does not respect the history of the graveyard. 2. Historic graves are sometimes shallow. Still-born babies or new-born babies who died within days or weeks of birth are often put into shallow graves. Even if baptised they didn't require a full burial ceremony with rites and relatives often buried the baby during the night in shallow graves. Levelling the ground for spreading gravel can disturb shallow graves and who has the right to decide we can disturb someone's grave? 3. Most parts of a graveyard, especially S & E of the old churches are occupied by graves. Some of us could afford headstones, some marked the graves with fieldstones. Others raised a mound over the grave. In some cases only a sunken grave hollow can be seen. Covering the graveyard with gravel disturbs and masks humps and hollows which are family's graves. Prioritising headstones is ignoring the majority of burials in the consecrated space and wipes out the memory of many graves. Who has the right to decide only to remember those who could afford a headstone? 4. Our rural graveyards were often managed as hay meadows - meadow flora and fauna prevailed across Ireland in the burial grounds. 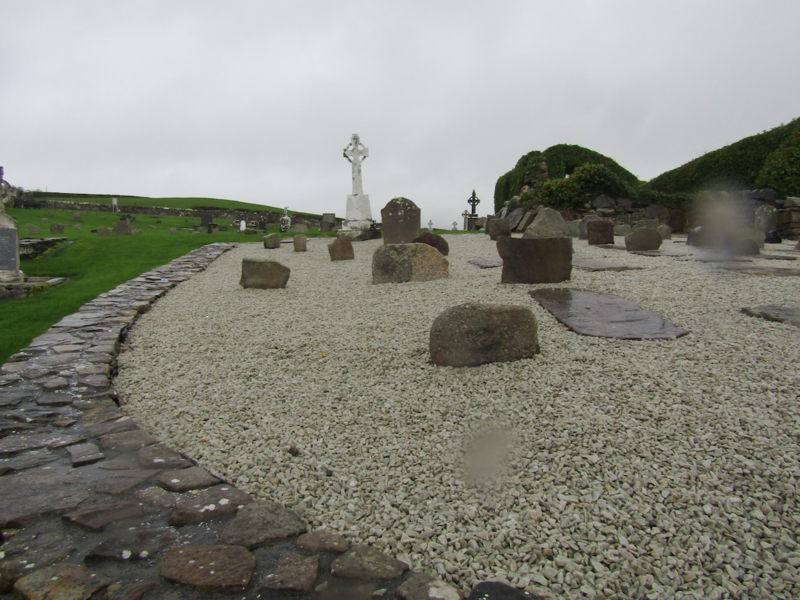 Covering the graveyard in gravel completely breaks with the old system of management and lessens the biodiversity of the parish. Not smart - more plants=more insects=more birds = better environment = better parish. Would you rather sit by a grave and listen to the birds sing or just listen to the crunch of gravel underfoot? 5. Suggestion - scrape up the gravel and reuse it elsewhere in the parish. Reinstate hay meadow flora more suited to the sacred ground.